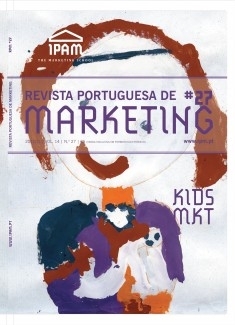 A Revista Portuguesa de Marketing (RPM), publicação de âmbito internacional, é a primeira revista em Portugal de cariz científico e académico dedicada ao marketing. Fundada em 1995 e com mais de 25 números publicados, a RPM tem, actualmente, uma periodicidade semestral. Encontra-se indexada nas Bases de Dados da ProQuest, Latindex e ESBCO Fuente Latina. Este número é uma edição especial sobre Marketing Infantil, estando venda exclusivamente no formato ebook. "Catch them young" - advertising on television aimed at children. Sara Pereira, Manuel Pinto Adolescents´ attitudes toward internet advertising. Paulo Ribeiro Cardoso, António Cardoso The Effectiveness of Advergames in enhancing Childrens Brand Recall, Image and Preference. Rui Rosado, Luísa Agante Young consumers and celebrities. Ana Jorge Children, packaging and on-pack nutritional information: an exploratory study. Margaret Josion-Portail In-store marketing to Children: US Food Retailer Practices Abating Childhood Obesity. Nancy Childs The meaning of shopping to children: a comparison between Portugal and USA. Luísa Agante An Empirical Study of "Little Emperor" Shopping Behaviour. Osmud Rahman, Xiaopeng Chen, Raymond Au The Child in Consumer Culture: Kid empowerment and the role of consumer associations.